I've seen an option of instagram in photo gallery and It is asking for client ID and Token ID which I have no idea about. I tried putting the instagram username in the fields but it didn't show the images. 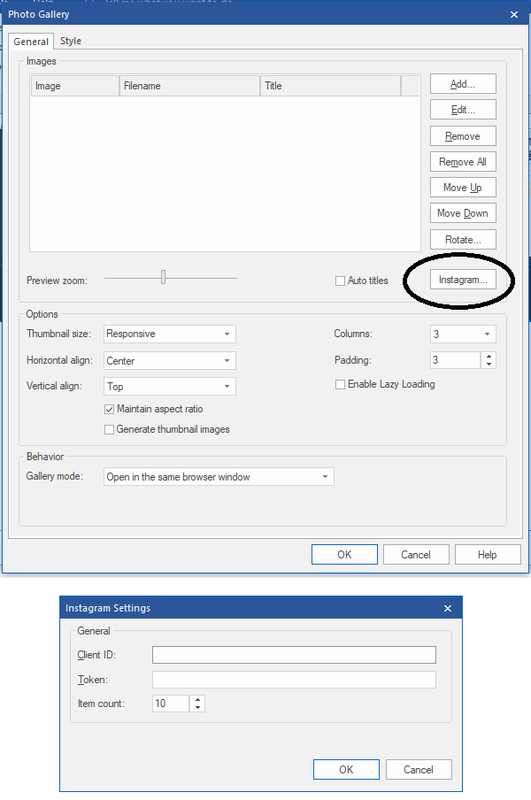 Could you please let me know how can I add an insta feed in image galley, if there is any tutorial available, please share the link. Or if someone could give me the client id and token id for insta user name @thehaelyn, I'll be very thankful. where ACCESS_TOKEN is your access token. '1234567890' is your client ID. Note that Instagram constantly changing it's developer API. Thanks a lot! I'll give it a try. And thanks again for WWB 14 as well. I took an id and also a token from the developer section from Instagram. but my Instagram photo gallery doesn't see on my screen! We love WYSIWYG web builder and Pablo! If it does not work then there is usually an error in the settings. Please double check your settings.